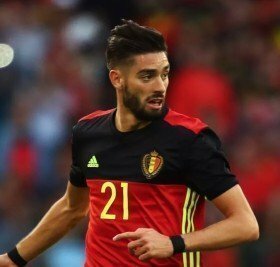 Belgian football expert Kristof Terreur has said that Arsenal are unlikely to afford the signing of Yannick Ferreira Carrasco, who is desperate for a return to Europe this month. The attacker made the surprise move to the Chinese Super League with Dalian Yifang nearly 12 months ago but he has struggled to settle to the new surroundings which has urged him to pursue a fresh European club. Speaking on The Transfer Podcast, Terreur has now revealed that both Manchester United and Arsenal have been offered the attacker, although the former don't seem to be interested in any kind of move. He added that the Gunners are likewise yet to make an approach for the Belgian, although they are unlikely to afford even a loan move unless he takes a paycut on his current weekly salary. "Arsenal are looking for a winger, but do not have the money to buy him. If they are considering to take him on loan, he will have to take a pay-cut, because he earns around 180,000 euros a week. It's a lot of money," he said. Arsenal have been hampered in the attack front this term with injuries to Henrikh Mkhitaryan (short-term) and Danny Welbeck and this has been highlighted as the prime reason behind the search for a new wideman.